In this class we will take even more inspiration from the painting of Dutch masters! Moody, lush and abundant arrangements that celebrate the bounty of the season. We'll be using the first spring flowers like narcissus, muscari, frittillaria, the best parrot tulips, passion vine, dianthus, jasmine and more. I'm desperately in love with your flower blog! All these flowers are amazing! I shared a post about you if you don't mind since I love talking about flowers every Wednesday. Its my favorite thing in the world! 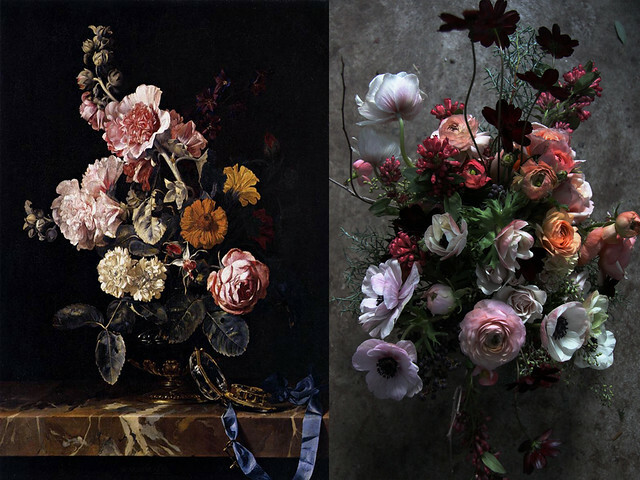 I just blogged about your brilliant class on dutch masters flower arranging. I am a photo stylist and this type of arrangement has always been on the top of my list. thanks! great blog.